um ein Gewerbe im Bereich Landwirtschaft zu betreiben. to buy 8 sacks of fertilizer to use for growing maracuyá (passion fruit). Alex Yobany benötigt für dieses Geschäft noch 1250 US-Dollar. » Schon mit 25 US-Dollar können Sie Alex Yobany unterstützen! Geld wird für Alex Yobany gesammelt. Alex is 41 years old. He lives in a civil union and has two children. He lives with his family in the municipality of Santa Barbara. Alex has been growing maracuyá (passion fruit) for three years in an agricultural area that is adjacent to his community. He sells maracuyá by the pound at the local market. Prior to this he worked growing coffee. Alex is asking for a loan of 30,000 Lempiras to buy 8 sacks of fertilizer to use to grow his crop of maracuyá. This will allow him to have a better yield this year and increase his income. 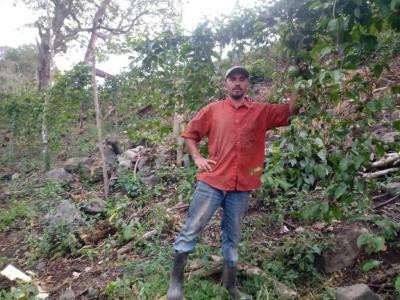 His goal is to grow between 3 and 4 acres of maracuyá.